Dreamworld - no new roller coaster 2017-18? Dreamworld has confirmed today in a Facebook comment that they have no plans "at this stage" for a new rollercoaster. 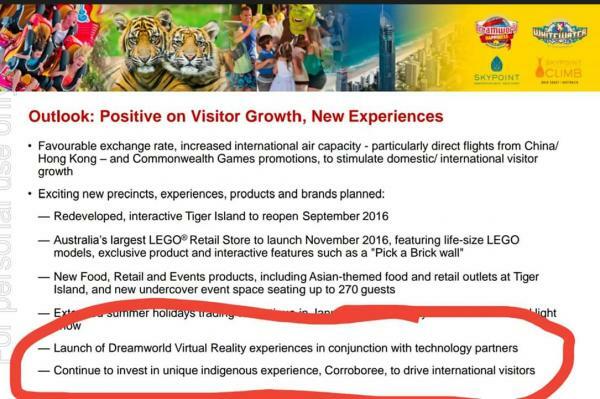 Judging from that, sadly, I guess that means no new major rollercoaster at Dreamworld in the lead up to the 2018 Commonwealth Games otherwise they would have already prepared financially & logistically for it especially given the 1.5 year time frame they got left before the Games (If Movie World's major rollercoaster takes a year & 5 months to just build, that leaves only 2 or so months for Dreamworld to begin work on theirs & if they have no plans, well 2 months I think might be too little to prepare financially, creatively & logistically). I'd be expecting more thrill flat rides to be built instead in the lead up to the Games unless Dreamworld in the near future decides on a smaller rollercoaster that doesn't take as long to build, finance, decides themes for & organise the construction site for. I think the idea of any type of rollercoaster opening at Dreamworld during or before April 2018 is now less likely. Since they opened a few months apart, I was hoping it would be time for a new DW rollercoaster too. That said, DW has gotten a fair bit of smaller stuff over the past few years. I'd say it's going to be at least another 2 years then if they're going to go for a coaster, they'll probably want to concentrate on something for the CGs over these years and a rollercoaster would have to go up next year. I don't expect them to give away any future projects to randoms on FB anyway. Wacky Worm in the car park? Ah, so no NEW rollercoaster. That doesn't rule out fixing up old, SBNO ones ??? I would think that too but in regards to Jamberoo, I find out a lot of accurate information about their future plans from Facebook comments - it's usually not what they say but how they say it. I only recently started looking at the Facebook pages of Gold Coast theme parks again when the Mack Rides crates appeared at Movie World so I will probably get a better idea of their accuracy over the coming months. In any case, if Dreamworld did have plans for a rollercoaster, rather than saying bluntly "not at this stage", I would have expected them to say "you'll have to wait & see" - this allows them to say 'yes' without actually saying 'yes' especially if publicity for a large rollercoaster was to start shortly (like how Movie World's new rollercoaster was due to be announced a few weeks ago). A major new rollercoaster would of been budgeted in by now - so there would have been some sort of 'plans'. But I do hope Dreamworld does have plans for a new rollercoaster. Other than the significant investment in Tiger Island, are you able to confirm if there's any other big draw card on the horizon in the lead up to the 2018 Commonwealth Games? Fair enough if that's all hush-hush at this stage though. Future - Yes I can confirm. Is it ready for discussion? no. Do I think it is the answer to the prayers I read here? No. but I think you will see the logic in where we are headed? Yes I do. 8 - When are you getting a good rollercoaster or dark ride? - It is in the 10 year plan so sometime in the next 10 years. Remember, the question says "or" and @The Original Belinda Brown's answer didn't specify which ride(s). As a result of the Facebook comment, I feel now it is more likely that they were referring to a dark ride than a rollercoaster. Here is something to note though - Dreamworld has never gone longer than 9 years (1988 to 1997) without building a new rollercoaster structure or 11 years without building a new rollercoaster structure with a new theme (1986 to 1997) so given Buzzsaw, their most recent rollercoaster, opened in 2011, a major rollercoaster might be 'pencilled in' for the post-April 2018 part of their 10 year plan but more in the April 2018-June 2022 time period (up to June 2020 if 9 years, up to June 2022 if 11 years). A major rollercoaster might be 'pencilled in' but I don't think the plans are serious/set to go yet hence "not at this stage". I wouldn't pass judgement yet even if DW had plans for a new roller coaster whether it be next year or 2yrs time there not just going to share it on there Facebook page. By emails there hard enough to get answers from I don't think it would be any easy on there Facebook page. Also remember if it is top secret and only high management know. How would their marketing team know. Maybe the next part of the park they'll focus on will be Gold Rush? Which might (and hopefully) involve the return of Eureka Mine Ride??? Even if it's not a new roller coaster I really hope DW will be adding an exciting new attraction within the next year as I think anytime after 12 months will be quite overdue! It's not exactly like DW have been sitting on their hands. they have invested serious capital on new/refreshed F&B outlets across the park, the Brock Museum, new TI, Lego shop. Whilst these may not be thrill rides or coasters, they are offerings that engage and please their core market - families, and also experiences that make DW a more complete full day park. It all really needed to be done. There's still more to go. If I recall correctly, that is one of the areas they were looking at next. Can't recall if it was that or the back of park area around the animals. Might be that way actually with the new Aboriginal stuff. It's one of those things that's on the cards if timing and funding permit, but don't hold your breath on it happening anytime soon. 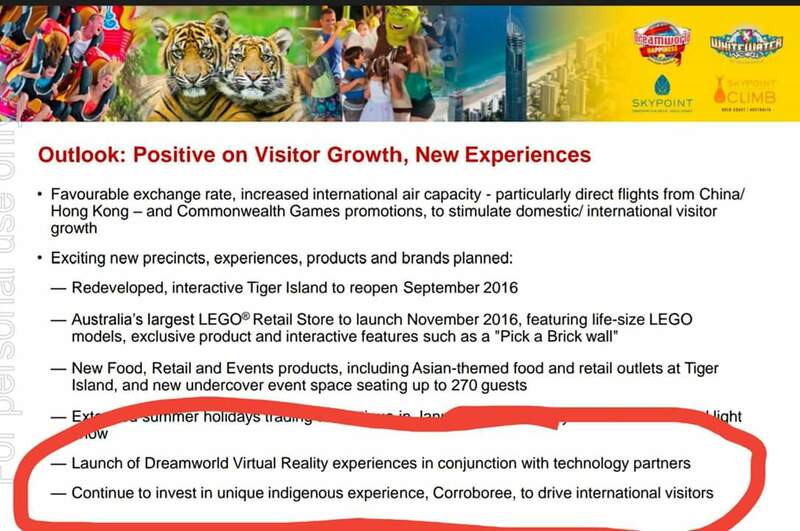 Yeah, if you read the future prospective section of the latest annual report, it says they want to continue investing in the Corroboree. Word from the staff there is that a refurb may be finally on the way soon, after being put on the back burner for many years. I believe that's what will be next in line for them. Goldie definitely needs a new enclosure ☺️? That would be the bright side if Dreamworld Corroboree was reverbed, the old skylink station might be removed at long last. DW is still the superior full day park for Families. MW has the best coasters, and will continue to do so. DW also hasn't fallen off at all, they improved their offering dramatically in the last 12-24 months. 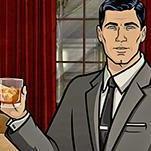 MW is ahead in some categories, but DW is still way ahead in others. Take a deeper look at what amazing things they've done recently. Don't judge the parks just because MW has more coasters, there are a lot more things to a theme park then just coasters. I dont know the exact figures but i would guess MW and DW have similar attendance rates. But based on the quality of rides MW beats DW hands down in my opinion. Again, stop basing the parks off the quality of rides. Sure, it's a big factor but it's not the only one. DW has experiences that MW doesn't offer and if you would want to compare family experiences you'll find DW is much further ahead. That is true! But for adrenaline and Rollercoaster junkies like myself and the majority of people in this forum, they would agree that MW has better quality rides. ? But for adrenaline and Rollercoaster junkies like myself and the majority of people in this forum, they would agree that MW has better quality rides. ? Whilst the majority here love a good coaster/thrill ride, I'd say nearly all of us appreciate that a great park often incorporates a lot more then a coaster/s & thrills. Your point about quality is also a loaded statement. Movieworld has better quality coasters if you are saying SE v HWSW or AA v MDMC. But to judge 'better quality rides' would depend on how one judges quality. Dreamworlds rides are all quality for what they aim to be. I'd say the same applies to MW. Ahhhh the age old Movie World vs Dreamworld argument. Look, i've worked at both parks now, and they both possess some great pros and cons on both sides of the highway. Looking at it as a purely family experience, Dreamworld has this unique proposition where you can go do a lot of great fun things as a family within walking distance. Tigers, solid kids areas, decent food, waterpark etc. etc. etc. All in a nice contained experience. Where Dreamworld goes awry is their finesse - i'm not sure if it's that Macquarie Leisure Trust methodology of treating the operation as a bank creeping in, but you only have to look at the queue lines for rides like Tower of Terror and Giant Drop to understand that some of the experiences become undone very quickly at a lack of care in some key areas, specifically showmanship for sure. And instead of looking after things and constantly improving, bean counters in the last decade have stripped the park, trains, boats, mine rides and all the characteristics that make us so nostalgic for what was. The good news is they're working on bringing that all back - Tiger Island looks incredible, i'm sure Lego will be great, and all the improvements they're doing add up, but is it enough? Is it stalling for time and keeping shareholders happy while they find someone who wants to buy it? I'm not sure. It's clear they're very interested in Main Events in the US, and that's become priority one, and unfortunately unlike Main Events the theme park industry is a long term investment game and without adequate consideration for this hard fact the capital needed to ensure guest expectations and experiences are met suffers. When you look ahead at Oxenford, they're not just working hard, they're steaming ahead at great pace and closing any and all gaps the competition has on not only Movie World, but VRTP as a whole. Totally from a personal perspective, but in the next year or two, if Movie World improved WB Kids and developed it into a much larger, immersive experience with a few new attractions, VRTP's combined offering from all their parks will have Ardent completely licked. What i'd like to see then is a Dreamworld that responds instead of a Dreamworld that's happy playing second fiddle, because if they keep the blinkers on for too much longer and pretend they can respond to perfect market conditions and a competitor that's burning money by dabbling in non-major experiences (referring to Lego) i'd dare say that's what will happen. VRTP are investing some serious dollars on building new things and improving on what's already there, and I don't see Ardent doing the same, and that actually makes me a little sad, because it's a small enough town with how few parks we have without one giving up and being comfortable that their signature roller-coaster is a Sydney hand me down, and that their signature thrill ride that they still use on the billboards to this day is a ride that's coming up next month on 18 years old. EIGHTEEN. Giant Drop will be 18 next month. If that doesn't say "we need a new big ride asap" i don't know what does. Firstly, remember that the Gold Coast is well known for it's theme parks - they are a icon. Secondly, therefore, internationally the parks will get a lot of media coverage so the 1st thing all parks are going to do is refurbish - they want to look good for international media and visitors during the Games. As we can see, all the parks are doing this as we speak. International visitors & media users, when they think of theme parks, expect hypercoasters, gigacoasters, stratacoasters etc, which none of these theme parks currently have. The closest in standard is Superman Escape, which doesn't qualify as a hypercoaster at a minimum, but is renowned as one of the best rollercoasters worldwide due to it's theming, flow and smoothness. Australian theme parks constantly tell us they can't build bigger rollercoasters due to it's costs and the size of the surrounding populations but if a reputation is at stake worldwide that the Gold Coast is Australia's 'theme park hub' then 1 hypercoaster at a minimum needs to be built. MW & DW were the 2 likeliest parks to have this built. I do recall someone saying that MW & DW have shared their plans in regards to pre-Games investments so given the enormous cost of a hypercoaster, I'll guess that they agreed that MW would build it (maybe they can handle the financial risks better?). Dreamworld may have taken a different strategy. The Games won't see an increase in international tourism until the Games themselves and after a short interval, again after the Games - though some people argue these post-Games tourism boosts never eventuate. In my opinion, they do occur but not on the scale people imagine it to be. So the biggest new investments don't need to be opened until Boxing Day 2017 at the earliest - as we know, MW's new rollercoaster is rumoured to be opening then. The biggest investments I'd expect will open in 2018, 2019 and late 2017 with major refurbishments occurring up to mid/late 2017. Remember, in my initial post I said it gave me reason there will be a new DW rollercoaster no earlier than April 2018 - they said "at this stage" after all so they may have plans (which theme park wouldn't?) but for it to open after the Games in 2019/late-2018 or even later (but no later than 2022 like I said in my previous post). The theme parks would obviously focus on improving all their theming as well as more focusing on their main themes (Australiana, water thrills, movies & the sea). Given that an increase in international visitation is highly expected to be a result of the Games, DW may focus on delivering more Australian experiences (e.g. Brock's Garage, Corroboree etc.) rather than thrills which MW can do as they are more flexible in this regard due to the movie theme they have (they are not limited to Australian movies). DW does have international things in their park (e.g. Tiger Island, Dreamworks Experience, Hotwheels Sidewinder etc.) but most of their park is still themed to Australia & international visitors to the Gold Coast would expect Australian experiences at DW rather than just general thrills that they know they can experience back home anyway. And when I mean 'experiences', I also mean Australian theming in rides. So in short, due to the Games & as a result of their respective themes, I'm expecting DW to more focus on the theming rather than thrill level of new rides while MW will focus on both thrill level & theming. Both parks will also ensure they cater for all audiences. Lastly, all of this requires significant investment so they would need to save financial resources to do it. A lack of new developments anytime post-2011 (when Gold Coast won the Games hosting rights) should have been expected so massive developments can occur to open around April 2018. If they did have plans, I'm sure they would have been tight-lipped and/or cryptic instead of just giving a direct answer implying no. Regarding the latter sentence, if you constantly e-mail them or they figure out you are a theme park enthusiast, they will not answer queries about future investments as openly as they would with a non-theme park enthusiast as they know that with a theme park enthusiast, the information will very likely end up being posted on places like Parkz. That's why I don't ask on social media, I wait until a non-theme park enthusiast does - a more open response is likely to be delivered then. I have noticed that, where possible, the social media teams of the Gold Coast theme parks give acknowledgement if management has not told them something or they can't confirm something. @Ryande16, in my opinion, a person's opinion of a theme park should best be determined by the parks' use of theming. An amusement park should best be determined on how well it amuses you. For example, look at Superman Escape - in an amusement park, it would just be a rollercoaster - leave the station, turns some corners, pause, launch, up hills, down drops, hit the brakes, arrive at station & laugh at your ride-on photo - but in a theme park, it is an experience - waiting for a subway train where a earthquake occurs with the only way out being the subway itself and just before the subway caves in, Superman saves the day. Superman Escape without any theming would do it's job at an amusement park - you get G-forces, acceleration, speed, heights etc. - but not at a theme park, the ride would be really generic. Add all the theming that you get with Superman Escape & you can see the difference it makes so it is credited as one of the world's best theme park rollercoasters - that is definitely doing it's job at a theme park. Really, the least thrilling rides can be made into a thrill by converting it into an themed experience. My favourite ride was Bermuda Triangle - not because of the ride design/type but because of the theming. When I think about Bermuda, for most of the ride, it is just people sitting in a boat - that's what you expect at an amusement park - but in Bermuda, they added roof cave-ins, dramatic music, lasers, fire/water/special effects, cinematic experiences, roaming characters etc. - it is an experience. That's what makes a great theme park ride. The ultimate example is the walk-through: At an amusement park, walking down a path could be just that but add a theme to that walking path and you got a whole new and different experience. 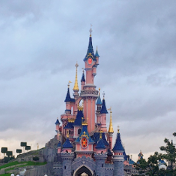 By the way, the best way to rank theme parks is a highly argued matter on Parkz so don't worry about it much (some people may disagree with my opinion too). Your opinion might be great for amusement parks but theme parks are a whole different ball park. In the end, it is your opinion. Can someone cliff note that for me please?